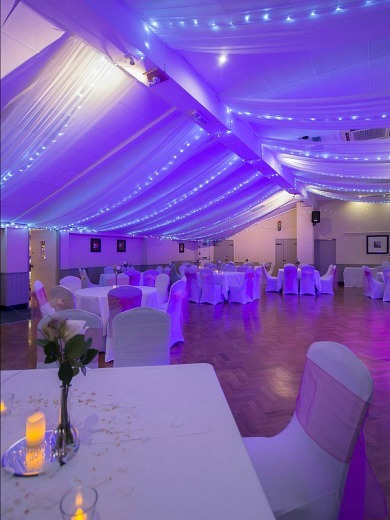 The Olde Barn function room at Grappenhall Community Centre is the largest of our rooms available for hire. Located on the ground floor, it has a private entrance adjacent to The Bellhouse, is totally self-contained with disabled access and disabled toilet facilities, has a licensed bar, fully fitted kitchen, sound system, Free WiFi, projector, screen and a stage if required. We offer a bespoke service for wedding receptions, whether you are looking for an informal party or a full package we are here to help you every step of the way. Ceiling drapes with lighting effect.